Digital products such as eBooks, training courses or software offer a lot of income opportunities for people who want to start an online business. That’s because they are easy to create and access by anyone. If you are interested in promoting digital products as an affiliate marketer, this article will show you how to use Clickbank and make money online, full-time. Clickbank is a digital online retailer that allows content creators (aka vendors) to list their products for sale and to promote through affiliate programs. To participate, you need to set up an account first (it’s free). After the verification, you can go to the marketplace and check out the vendors offer. Each listing is will look something like this. 1 – Hypertext link to the main product page. 2 – A brief description about the product. 3 – ‘Stats’ that represent the sales, earnings and popularity of the product in the marketplace. 4 – Icons that represent the product features such as the language, the recurrence of sales and shipping availability. 5 – ‘Vendor spotlight’’ is a special page that offers details about the vendor’s profile, their sales performance and affiliate news. When you include this link on your promotional content and a reader follows through to the point of purchase, you make a sales commission which is based on the net sale price (after subtracting Clickbank charges). The commission is usually higher than physical products (within the range of 50 to 70%) and you can cash out the payment for as low as $10. Take note that $150 is the maximum commission you can earn on a single sale transaction with Clickbank. This is probably the main question that you need to find out when using Clickbank. You might have heard of some fast-and-easy way to promote affiliate products. In my opinion, if you adopt these types of techniques, you wouldn’t be making money for the long term. However, if you follow these step-by-steps, I can guarantee that you’ll achieve better results. 1) First, you need to identify a niche that you are interested in, preferably something that you have skills and knowledge about because you’ll be promoting to this group of people over and over again. 2) Next, you need to create a website (not a webpage) as a source of information for your readers and for you to build authority within that niche. 3) Before promoting the product, it’s best to try it out to experience the results yourself. That way, you can gauge the quality level, vendor’s commitment and help your readers make better purchasing decisions. 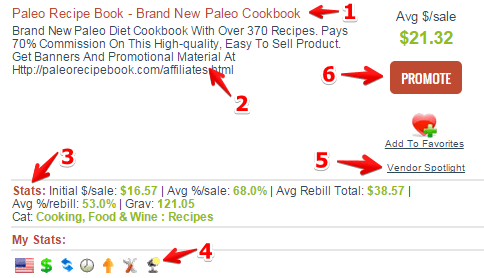 Best Online Paleo Recipes (competition = 1) << This is a good one! 5) To get traffic to your website, you are going to build content for your niche by publishing relevant articles regularly that point towards your product review page. Again, you should focus on long tail keywords because they rank better in the organic search. 6) Other methods that you can use to promote your article/product review are social sharing, email marketing, banner ads and bonus offers. 7) When you are finally getting conversion from these organic sources, you can then venture into paid traffic source such as PPC and Facebook Ads. Plan your budget wisely as you shouldn’t be spending more than what you invested in. Unlike other networks, it’s fairly easy to obtain the affiliate links from any vendors in Clickbank. Most of them do not do any screening or require any information from your side. But this is where a lot of people misuse/abuse the use of affiliate links. So here are some gentle reminder to keep in mind when it comes to promoting digital products. Don’t promote a product if it’s NOT RELEVANT to your niche. You’ll confuse your audience. Don’t place affiliate links into every single article that you publish. The search engines see this as an overzealous self-promotion tactic. Don’t place affiliate links directly on social sites. That’s an act of blatant spam. Do work with good quality products as it will give more value for conversion. So, Is Clickbank Worthy of Your Time? That really depends on what type of niche that you are involved with. Clickbank currently offers 23 types of product categories that are fairly popular these days online. If you can find one product that matches your niche, by all means, promote it using the methods that I’ve mentioned above. If you can’t find one, don’t feel despair because there are many more opportunities out there. Try JVZoo. It’s an affiliate network that focuses on digital products too. Search in Google using this phrase “niche + affiliate program” and you’ll discover other private affiliate programs. Consider promoting physical products relevant to your niche. That way, you can leverage from online retailers’ sites such as Amazon or affiliate networks such as ShareASale. I hope this article has given you a better idea on how to use Clickbank and make money for your online business. If you like to know more about website creation, keyword research and most importantly, driving targeted traffic to your product review page, then you should check out my recommended training platform for more information. Have any thoughts or questions about Clickbank? Just leave them in the comment area below and I’ll get back to you. I bet it’s really exciting to earn your first decent income selling digital products. I have a Clickbank account, just I cannot really find relevant products to my niche. I guess my niche needs “real” products for selling. But the commission sounds amazing! Others pay cents comparing to this. Yeah, digital products are really lucrative if you are good at marketing them, but getting your first few customers can be challenging because people are generally wary about online scams. Physical products convert easier because they are things that people can touch and feel, hence it feels more ‘genuine’. If you like to learn more about the difference between the two, check out this live training for free. Awesome article on how to use Clickbank and make money as an affiliate marketer Cathy! Judging by your article, Clickbank sounds very easy to work with and use to promote their digital products. I have heard that there are a lot of poor quality products on Clickbank however, have you had any experience of this? Thanks for the suggestion of JV Zoo as well, I will check them out too. Great to hear from you again, John. Rather than poor, I think there are more shady products to look out on Clickbank, especially in the sector of eCommerce and online marketing. The good part however is that you can tell the difference easily by looking at the vendor’s official site. Some have poor navigation, lack of updates and simply pushy. The better ones are more reader friendly and they offer a lot more value for their products. Great article on Clickbank. Clickbank is the only affiliate network I have made money on so far and I find them very easy to work with. Payments come on time as well. Are you planning to review other affiliate networks as well? There are just so many affiliate networks out there and it would be very useful to learn about a few more even though a lot of people stick to Clickbank. Yes Jojo. There are other reputable affiliate networks out there and I’ll definitely write more about them in my blog moving forward. Here’s my review on ShareASale and Rakuten Linkshare if you wish to learn more. Hey, I really like your article on Clickbank. I use them sometimes also. I also try and find the products that don’t have annoying auto responders that spam people’s mail 2 a day. I think that’s one of the problems with Clickbank, but if you can find a good quality digital product that don’t spam, then I think it’s a great platform to use because they pay quite well. As a promoter, I would also like to go through the sale process before I pick a particular product. Going through the process as a buyer will give you a lot of insights about how a particular organization deals with their customers online. This is certainly something to leverage from, whether you intend to promote or compare that product to something else.